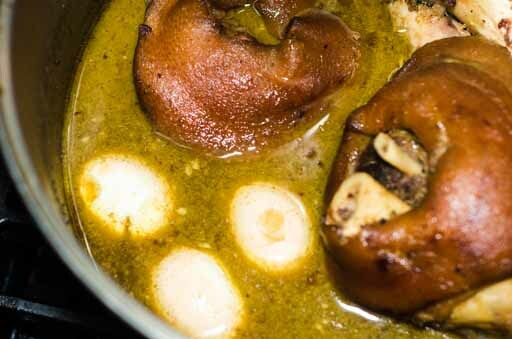 Walking around Thailand’s streets, markets and food courts, if you spot a giant bowl the size of baby bathtub with rich dark brown liquid bubbling with deep brown pork shanks and green Chinese broccoli on the side, you might want to stop for a treat. It’s a comfort food, it’s a favorite food and it’s so delicious. In Thailand, when you order the Braised Pork Shank (aka Kow Kha Moo), you'd let the vendor know if you want, rind only, meat only or combo. The skin on Braised Pork Shank is soft and gummy and the meat is tender and full of seasoning. Together with the blanched Chinese broccoli and pickled mustard, the braised shank tastes so good with the slightly spicy and sour chili garlic sauce. 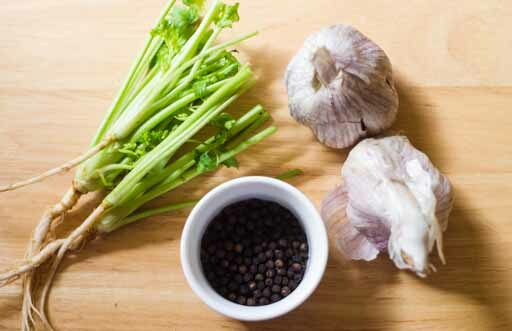 You’ll also get fresh garlic cloves and Thai chili peppers to cut the cholesterol down. Served with rice, the Braised Pork Shank is a complete meal with meat, vegetable and pickles. 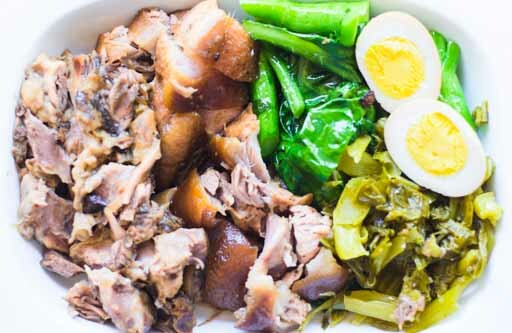 This braised pork shank recipe is easy to make but has many steps to it; boil the pork shanks, make the seasonings, boil the eggs, blanch Chinese broccoli and chop the pickled mustard. With 2 shanks, you can make it a day in advance and have many delicious meals. You can’t go wrong with Kow Kha Moo. Frying the pork shanks give the rinds and meat a nice brown color and firm texture. Cilantro roots are not always available, you can substitute cilantro stems for cilantro roots. Homemade pickled mustard is amazing, see the recipe. Some people boil the pickled mustard with the shanks. You can do so too, but remember to reduce the salt and soy sauce as we don’t know how much salt is already in the pickled mustard. I boil it separately to control the salt and keep it looking clean. 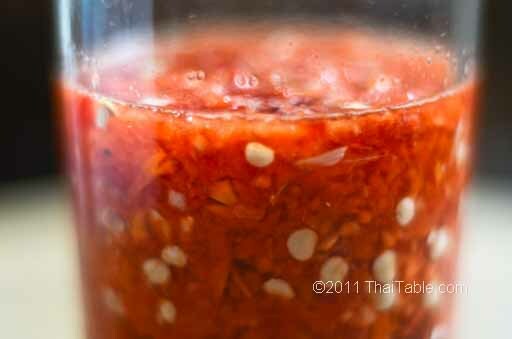 But boiling it all together creates a delicious pickled mustard with braised pork flavors. To keep the spices all together for easy removal, you can put the cinnamon stick and star anise in a mesh spice bag. 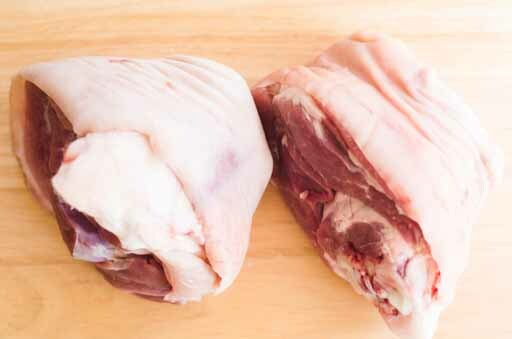 Rinse the pork shanks really well to remove any small bits of bones and pat them dry. 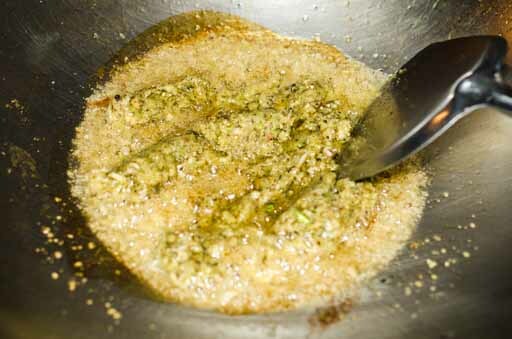 Add about ¼ cup of cooking oil to a wok. Gently lay a shank in the hot oil. Let the skin fry until it turns white. 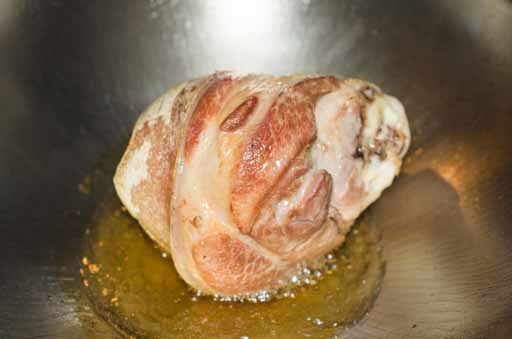 Fry the meat until it turns light brown (picture 2). It should take about 5-7 minutes. Fry the other shank the same way. Remove the shanks into a large pot. Fill the pot with 3 quarts of water. It should almost cover the shanks. Let it boil without the lid or with the lid ajar to reduce the liquid. Keep the oil in the wok for frying spices. 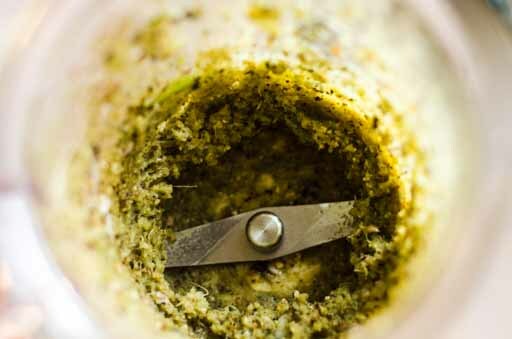 Grind garlic, peppercorns and cilantro roots in a blender or mortar pestle (picture 4). Add the mixture to the wok and fry over medium heat. After a couple minutes, you should smell the aroma (picture 5). Remove the spice mixture and add to the pot. 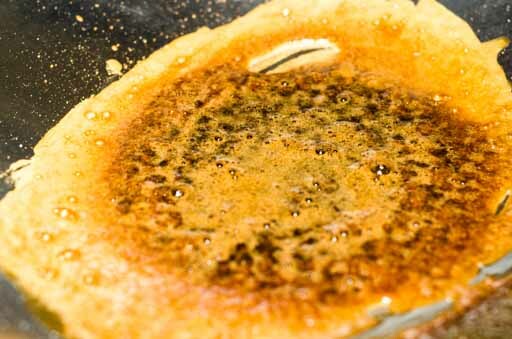 Leave the oil in the wok, you'll use it later. Let the shanks continue to boil. Toast the cinnamon stick and star anise until they are fragrant or start to burn. You can toast them in a cast iron pan or in an oven. I toasted them in a cast iron pan and it took me just a few minutes. Remove them and add to the pot. In the wok, add 3 tablespoons of sugar, ½ teaspoon of salt and 3 tablespoons of soy sauce. Let the sauce mixture come to a boil and thicken (picture 7). Add the sugar and soy sauce mixture to the pot and keep it boiling. 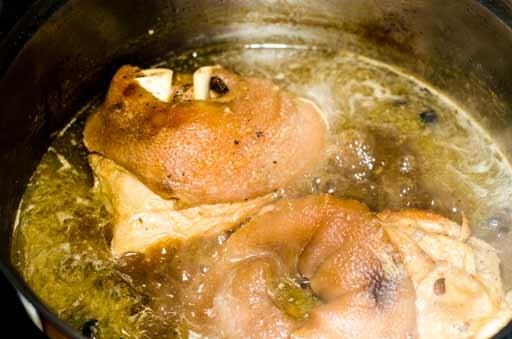 As the broth gets reduced, move the shanks around to get the all the parts submerged so that everything cooks at the same rate and the meat acquires the brownish color. Boil 3 eggs or as many as you’d like. Let the eggs boil for 4 minutes (when it starts to boil, let it go for 4 minutes). Remove the eggs and let them cool down in cold water. Peel and drop the eggs into the pot. At this point the shanks should have been boiling for about 3 hours. The broth should be reduced by half. Let the shanks sit overnight (If you can wait) for a deep flavor; the seasoning will permeate the shanks and the boiled eggs will turn brown. The shanks are ready when you can see the bones poking out and the meat comes off the bone easily. The rinds have a deep brown color. Total boiling time is about 3-4 hours. The next day when you’re ready to serve, remove the eggs if you like soft eggs. Otherwise, let the eggs boil in the broth until you're ready to serve. Let the pork shanks come to a boil. 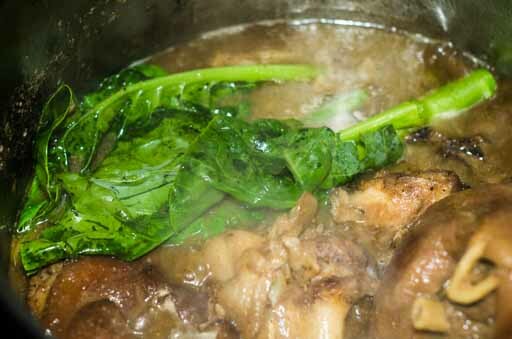 Drop the Chinese broccoli in the pork shank broth for a couple minutes. 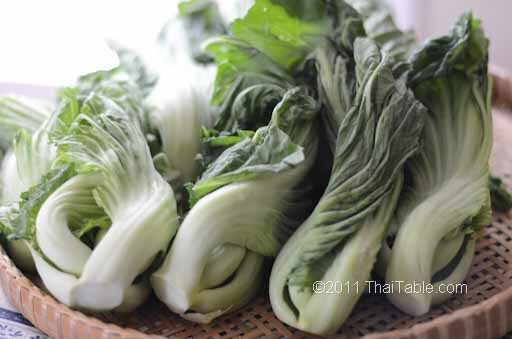 Remove the Chinese broccoli and cut into 2-inch pieces. Transfer the Chinese broccoli to a serving plate. Rinse the pickled mustard and boil the pickled mustard in plain water for a couple minutes. Remove and drain the water out. Chop and add to the serving plate. To plate the shanks, remove the bones and chop the shanks into serving pieces, ladle some broth on the shanks. You can serve the shank, Chinese broccoli, pickled mustard and eggs in a platter and have a bowl of rice on the side. Or you can serve individual plates. 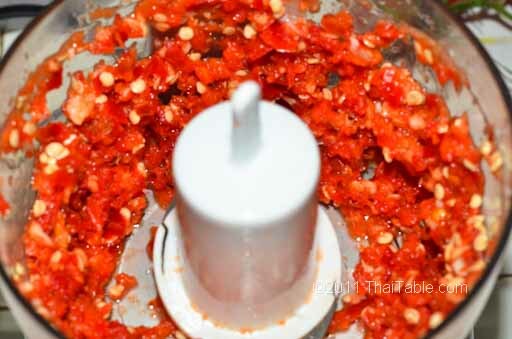 Serve with a chili garlic sauce, cloves of garlic and Thai chili peppers. The purpose of the sugar is to feed the microbes. Some people use the water that you rinse rice with, instead of sugar. Since you may not have rice rinse water on hand when you're making the pickles, I call for sugar, but you're welcome to use the rice rinse. Afterall, carbohydrates from rice turn into some form of sugar. In the North and Northeast, pickled mustard is made with cooked sticky rice instead of rice rinse or sugar. 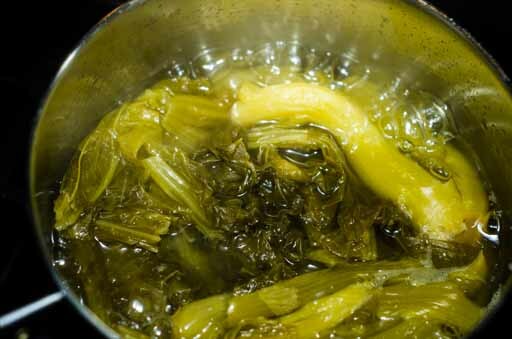 Rinse mustard greens in cold water. Make sure you get the dirt between the leaves out, especially on the stems. Cut them lengthwise or into large chunks and place in a large bowl. Add the salt and mix them well. My mother would add just salt and massage the salt into the mustard greens. Some how I can't bring myself to bruise the beautiful greens. My unconventional method is to add salt and mix them. 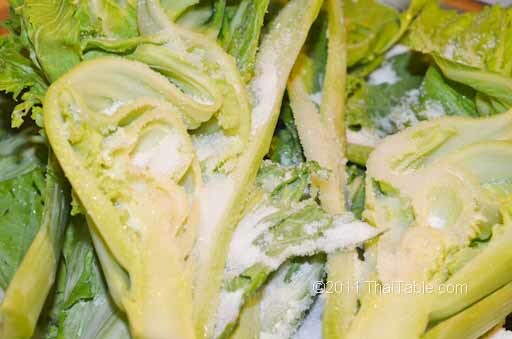 Then add some water to dissolve the salt so that it can get inside the mustard greens. Leave the mustard greens at room temperature overnight. Any glass jar (or old pickles jar) is great for pickling mustard. Wash the jar in dishwasher (high water temperature) or boil the jar for 10 minutes to sterilize the jar. After sitting in brine overnight, the mustard greens should be wilted, but still green. Rinse mustard greens in cold running water to remove the salt. Pack them into the jar tightly. Add a teaspoon of salt and 1 tablespoon of sugar. Pour enough water to cover the mustard greens. With my jar, it took 2 cups of water to cover the mustard. Close the lid. You may want to place a small dish or bowl inside the jar, on top of the greens, to push the greens down and keep them submerged. Keep the jar at room temperature. You'll see the color starting to change from green to yellowish green. It took 1 week during the fall with average room temperature at 70 degrees. When I make it in Thailand, it takes 12 hours at room temperature(90 degrees). 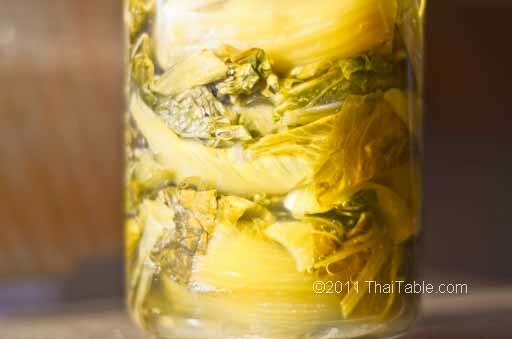 When the pickled mustard is ready, it should be yellowish green. Taste a piece to see if it is ready. It should be sour and salty, but more sour than salty. Be careful when you take the pickled mustard out, your utensil must be clean and dry. 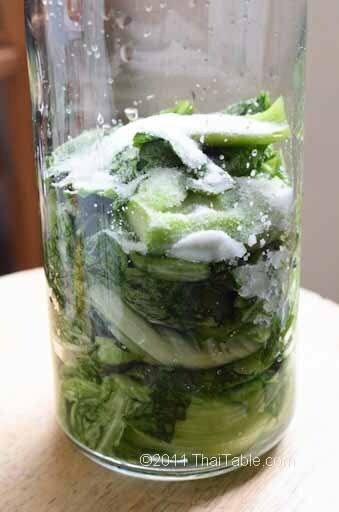 Any water or other materials that get dropped into the jar can make the whole jar goes bad. Your pickled mustard’s gone bad? When you see whitish film floating on top, it’s time to start a new jar. Toss out the bad pickled mustard. 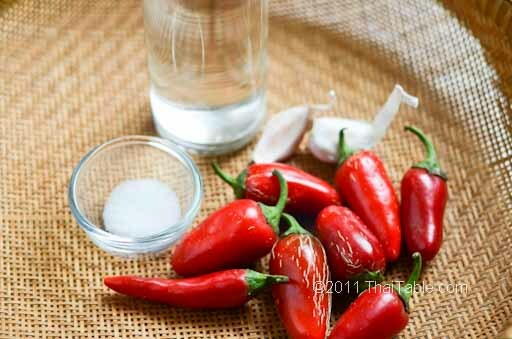 Wash and sterilize the jar in boiling water for 10 minutes. Start over again. How long can you keep the pickled mustard? I usually make mine at the end of summer or in fall. I keep the pickled mustard until the beginning of the summer in the jar at room temperature.